OM8818 is a complete temperature datalogger system at a remarkable low price. Each set comes with Windows compatible software, a datalogger unit and an infrared download box with data links. 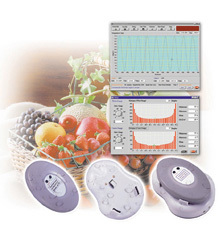 The OM8818 is ideal for monitoring ambient conditions in greenhouses, art galleries and museums. Temperature Range: -40 to 85°C (0 to 185°F). Sample Unit: °C or °F. OM8818: 124 x 52 x 92 mm (4.9 x 2 x 3.6"
Cable Length: 150 cm (5') with DB9 (9 pin) connector.